Between 23 and 28 of April, the Romanian Tenis Federation is organizing in Bucharest the largest European tennis competition for juniors under 14 years old that ever took place in Romania, Dr. Oetker Junior Trophy, the only competition on slag from south eastern Europe. Aproximately 200 players will compete in games of simple and double at Tennis National Center, close to Arena National Stadium, from Lia Manoliu Complex, in a competition supervised by Tennis Europe Juniors Committee, Regional Association of International Tennis Federation. From Monday, 23 of April until Saturday, the 28 th, all the passionate of tennis are expected at Tennis National Center. The organizers announce daily raffles with prizes, tennis lessons assisted by a professional trainer, played at the same time of the official games. Stars like Roxana Ciuhulescu, Monica Iagăr and Ellie White will speak to the public about the sports in their lives and will give autographs. Dr. Oetker Junior Trophy is held in our country after România has received European Junior Championships Nations Cup First title, ranking 1 st place in European juniors classification, in all age categories: under 14, 16 and 18. “Romanian juniors have obtained incredible competition results last year and Romania ranked first in Europe in all age categories for juniors, and these two facts show we are on the right path. Romania has received from Tennis Europe European Junior Championship Nation’s Cup First title, Ioana Loredana Roșca was nominated Player of the Year 2011, at girls under 16 category, Bogdan Borza – Player of the year at boys under 14 and Nicolae Frunză has received the same title, from the 3 rd position. The prizes received from Tennis Europe at General Meeting in Lyon and also the possibility to obtain the license for Dr. Oetker Junior Trophy, the only competition on slag in south eastern Europe, are all reasons of joy and empowering for Romanian Tennis Federation. It is a confirmation of the Romanian Tennis Federation support. The last year awards are a result of everybody’s work, from personal coaches, sport clubs and Federal Coaches, together with Competitions Commission. I wish good luck to all the competitors from Dr. OetkerJunior Trophy”, said Ruxandra Dragomir, Romanian Tennis Federation president. “We are proud that Dr. Oetker is the official partener of the 1 st degree Tour U 14- Dr. Oetker Junior Trophy, the only competition on slag in south eastern Europe”, said Ioan Cozma, general manager of Dr. Oetker Romania.”We hope that the success of this event, a recipe with substantial contribution from Dr. Oetker, to come as a support for tennis performance. Dr. Oetker continues this tradition of supporting children and the young who dedicate their time and energy for this sport. We have been sustaining important competitions like Victor Hănescu Trophy or European Summer Cup 16, because we want to support our future champions. We wish that more and more economic agents would join our efforts of supporting the future of this sport. We have great expectations now, when Romania ranked 1 st place in Europe, at juniors category, and we hope the same will happen this year”, Ioan Cozma, the general manager of Dr. Oetker Romania, added. The romanian juniors nominated the best European tennis players – Ioana Roșca – Player of the Year 2011 no. 1, U 16, Bogdan Borza – Player of the Year no. 1, U 14 and Nicolae Frunză – Player of the Year no. 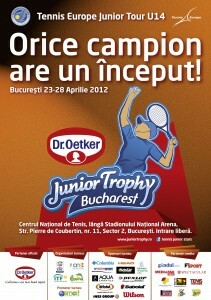 3, U 14, will come to Dr. Oetker Junior Trophy to play tennis with the juniors from the audience. The event will be transmitted internationally, through Live Streaming and you can find updated information in every single day of the competitions on the official site of the tournament, at www.juniortrophy.ro, on our Facebook page Tennis Junior Stars and also on www.frt.ro, Romanian Tennis Federation website.